Two and a half years ago I made my first batch, it was worth a third place. Although the results were clearly rigged (I have no real proof, but have a hunch) I probably had the best standard chili. The second place chili was more of a spicy seafood chowder and the first place chili was handed out by its creator, totally not allowed in an anonymous contest! Anyhow, last year I came back with a fury and won first place. I’m hoping it wasn’t a fluke, there were less competitors last year. So, this year I have to come back and defend my title. I’ve been getting challenges from everyone in the office. I had no idea someone had painted a bulls-eye on my back. I’ve been trying, with each batch of chili I make, to increase the heat by adding more and different peppers. I know I could cheat by adding hot sauce of various makes just to “add heat,” but I think that when you kick up the fire that way you really sacrifice flavor. So, I’ve kept chasing the perfect level of pain through pepper additions. Additionally this year, I was lucky enough to have our good friends provide the beef for this chili. My buddy Zippy (yep, that’s his name people), bought a whole beef earlier this year and still had a few roasts left over so he got me a 2.6 lb cross-rib roast. Now, just to let you know, I’ve had a few other tastes of this beef (named Durham) and it’s been some of the most flavorful and yummy I’ve ever had. In a crock pot, large enough to hold all of this, open the cans of stewed tomatoes and start cooking. Put crock pot on low. First thing is to get the meat ready. 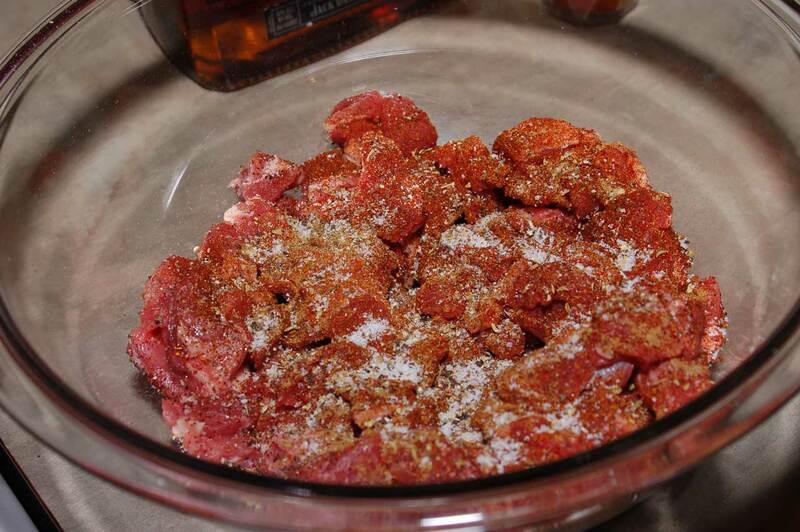 Pat roast dry with paper towels and cut into 1cm/1cm cubes, place into a glass/non-reactive bowl, once the bowl is half-full, season beef with all off the spices/seasonings (best guess or according to your tastes) continue cutting meat and once finished season beef again. Finely chop up the garlic. In a large skillet 12″ or bigger, heat olive oil to medium-high heat and add beef and some of the chopped garlic. NOTE: This will probably take 2 or 3 batches depending on your skillet/stove. Once beef is in skillet, chop the 3 serano peppers into little rings (don’t worry about de-seeding), take a portion of the seranos and place into skillet with beef. 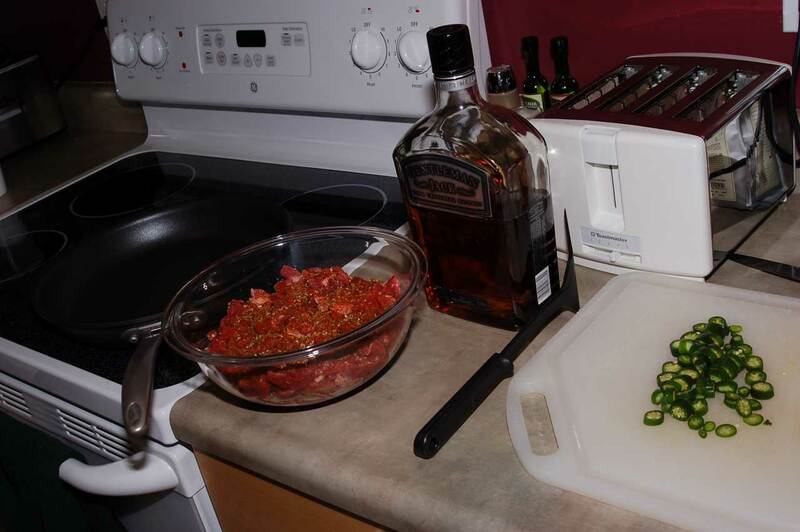 As the beef starts to brown take a portion of the whiskey and add to the skillet (carefully!). I use a lighter to ignite the alcohol and cook it off. 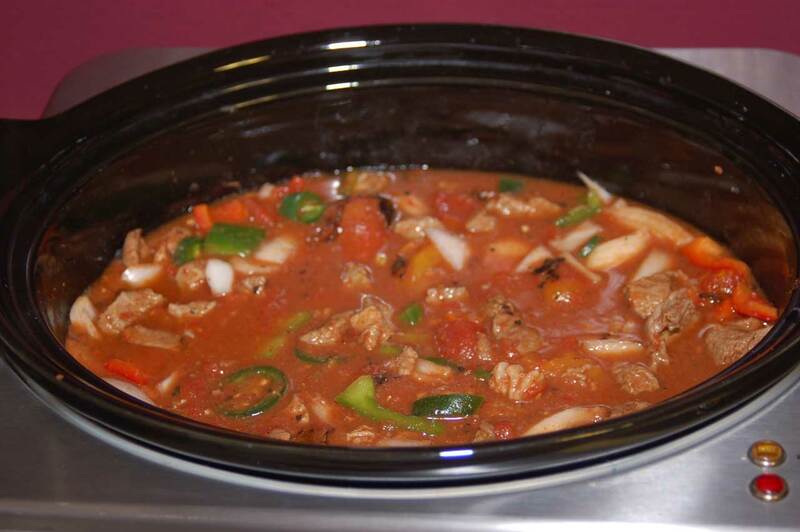 Once fully cooked place beef into the crock pot, repeat for as many times as necessary to cook all of the meat. The rest is super simple, Chop and de-seed the remaining peppers and add to the crock pot. 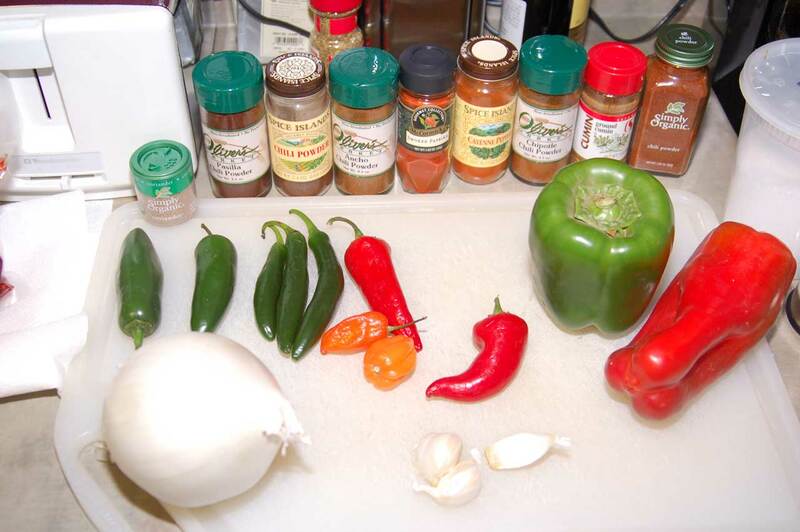 I dice some of the jalapeno and make some “nacho rings” but chop the others more finely. I chop the bell peppers and onion rather large. A note on the beans. I pre-prepared the beans before beginning my chili. I do not soak them overnight or anything. I do however put them in a large stock pot with salted water, bring to a boil and let sit one hour. I had done this a week prior for my “test batch” and froze the unused portion of beans for use in this chili. The crock pot really does the rest. I set my heat on low and set to cook for 8 hours. 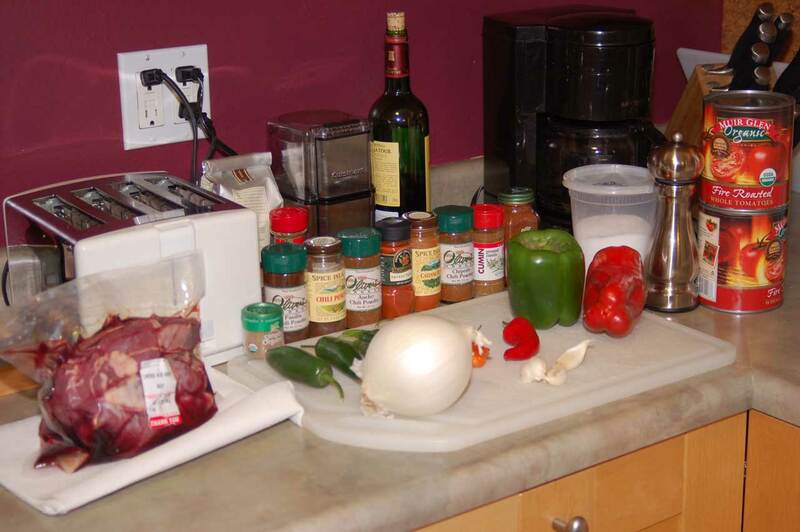 Test your chili’s flavor while cooking and add spices and seasoning as needed. I usually add more cumin and salt at some point. Now, some of you probably know what I’m about to say, but it bears repeating. Soups, chilis and other things, while tasty after cooking for this long, really develop their best flavor after cooling down and being reheated. So, I planned my cooking time into this. I started my chili in the evening so that it would be finished in the morning and I could turn it off and put it into the fridge to cool, then be reheated and perfectly ready for competition. Please consider this when preparing yours. There are many “condiments” that I would recommend with chili, included in those are: Sour Cream, Shredded Cheese, Nacho Rings, Chopped onion (red or white) and most importantly Corn bread! I was exceptionally pleased with this batch, after cooling and reheating it maintained a very good “heat” from the peppers and the flavor was great. Yes it’s Thursday, and in all rights I should be typing up a sweet recipe for you to enjoy on another “Not Bad for a Thursday Night Dinner!” Well, perhaps I’ll add a cooking tip at the bottom of this post… Anyhow, Tonight we had some super delish, filet mignon steaks, so I wanted to have some good red to pair with my dinner. 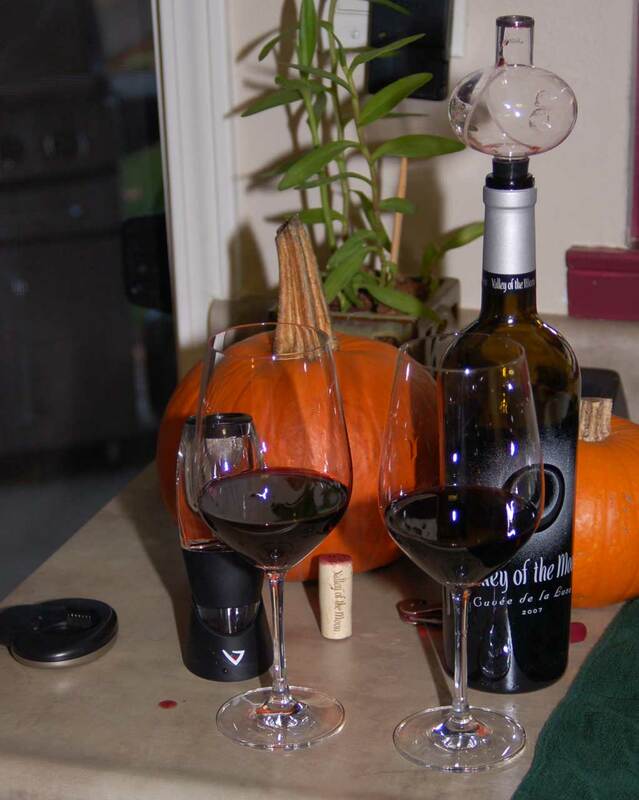 I picked out a 2007, Valley of the Moon, Cuvee de la Luna. 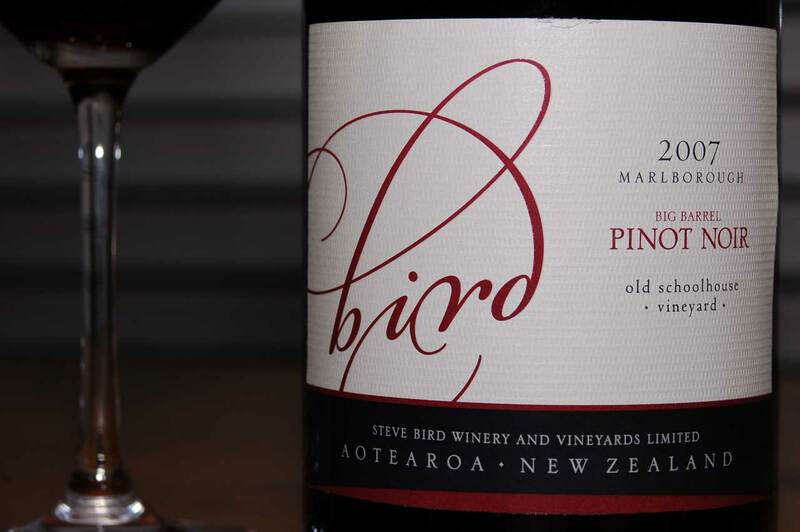 This wine has held a lofty place in my “go-to” Bordeaux style blend list of yummy wines. So, “the wife” said to me, “Oh, that’s young!” I was thinking to myself that yeah but the 2007s are drinking like champs so go with it right? But Wait! 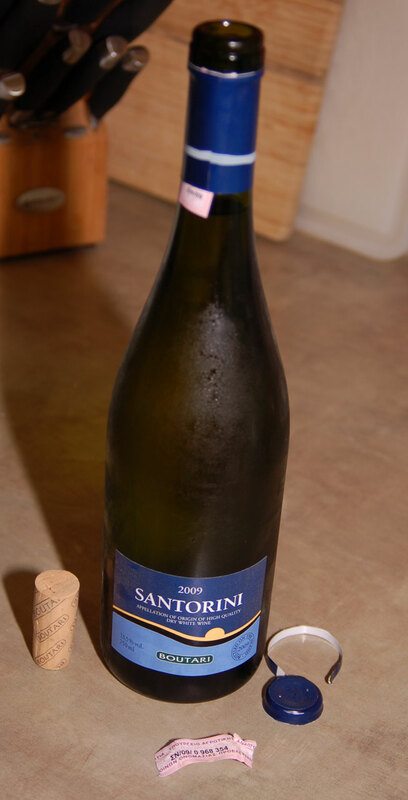 I have my Soiree, and since Vinturi never hooked up a completely unimportant wine blobber named Norcalwingman with a free sample Vinturi, I had to pick one up on woot.com. A heavy plastic or some other clear material V-shaped funnel type thing, with a nice filter screen and resting stand. A gasket wearing glass bulb, with some etched swirl lines. Well, it’s not really that exiting but in my completely unscientific test. The nose on the glass poured with the Soiree seems to have a higher/more robust aroma. The taste of the two are nearly comparable, but the olfactory sensation on the Soiree glass does seem to edge ahead of the Vinturi. Stay tuned for more head to head action. Now, what you’ve all been waiting for, a great tip on cooking your Filet Mignon. I used my gas grill tonight, I fired it up and brought the temperature up to about 350 F, on the built-in thermometer using the left two burners of my 4-burner grill. I placed my two steaks on the right side, upper grill shelf and cooked for approximately 20 minuted, until an instant read thermometer read 120 F. I removed the steaks from the grill, placed on a plate and covered with foil. In the mean time, I turned up the heat on the two burners to high. 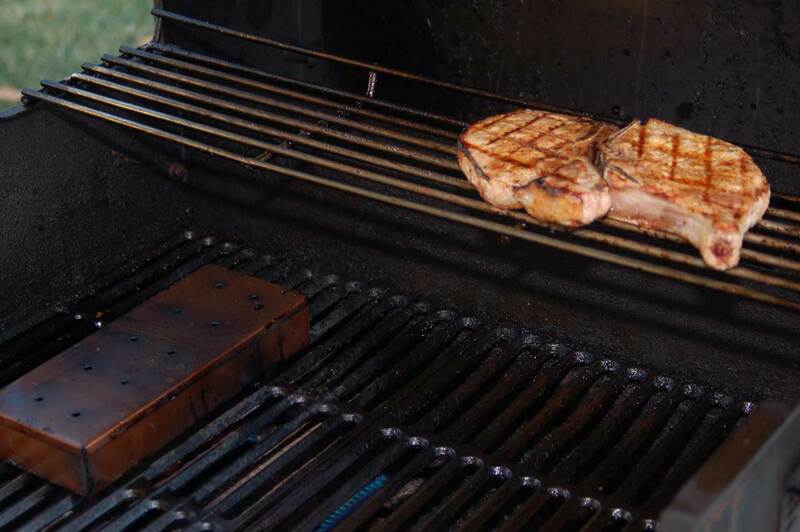 After about 5 minutes of rest, I returned the two steaks to the grill and placed directly above the flames. I seared each steak on both sides for approximately 3 min/side and served immediately. These steaks may be the best I’ve cooked yet! They were medium/medium-rare in temperature and supremely browned, just on the outside. I hope this tip might help you with your next steak, you have got to try this method! Short on Time? How about a quickie! Well if you’re lucky like me and have a 2 year old that means that your time is a resource that is in serious deficit. Tonight I had to figure out something that would be not only be done quick, but not be demanding on my time so I could keep an eye on the little monster running amok in the living room, bathroom, kitchen and every other room in the house. So here’s a great quickie and a surprising wine pairing. While the chicken is defrosting, boil 3 cups of water in a saucepan add 3 cubes of chicken bullion (you could do veggie instead for less fat). Once boiling take 1 tablespoon of cornstarch and 1 tablespoon of flour and mix into 1/2 cup of cold water, reduce heat to low and whisk in starch/flour/water mixture and stir vigorously. Chicken should be done by now, slice into 1/2 inch thick strips and place into 9×9 pan. In a mixing bowl add 1 cup of Bisquick and 1 cup of low fat milk and stir until smooth. By this time your “gravy” should be just about right. 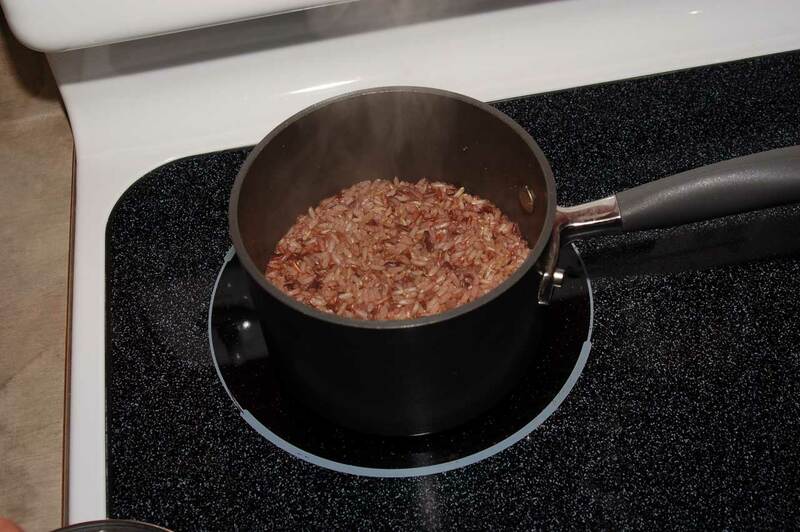 Pour the gravy over the chicken in the 9×9 and leave about 1 to 3/4 inches of space from the lip of the pan. Drop tablespoonful sized portions of the biscuit mix into the pan. Cover the 9×9 pan with foil and place into an oven at 350 F for 30 minutes. After 30 minutes, remove the foil and return to the oven for another 10 minutes. I cooked some green beans in a saute pan with some fresh chopped garlic (1 clove) and some olive oil, you should start the beans when the time goes off after the 30 minutes. Well, that’s about it. I did end up turning the broiler on for about 2-3 minutes to brown the tops of the biscuits at the very end. Total time to prep and cook this was right around 40 Minutes, from freezer to plate. Here’s the surprise. I had a bottle of Greek wine in the fridge, the 2009 Santorini, Boutari, Assyrtiko, I thought well, American comfort food might just pair up with this light and lively Grecian Vinological delight. The rich and salty biscuit and gravy really gets cut through by the great acidity of this wine and the citrus of the wine pairs up with the chicken just right! Yep, that’s it. Just a quickie. And well, I’m satisfied. The stars aligned and we were finally able to schedule this event and get together to taste some great wine, eat some great food, and have some amazing conversations about the juice we all love. Here’s a little background on Tom, I snagged this clip from his website, http://www.tomsimoneau.com/ (I’ll add some personal color from our experience). 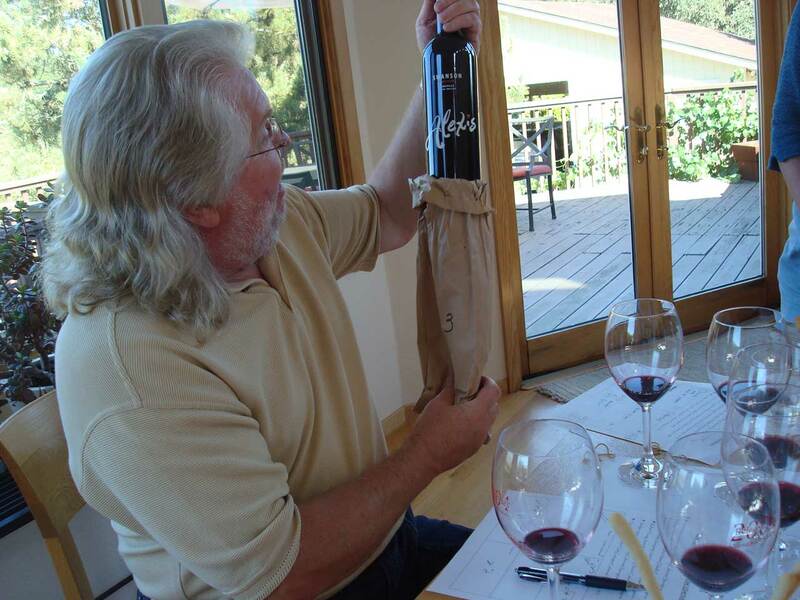 Tom Simoneau, the KSRO Wine Guy for the past thirteen years, knows the wine business. A grape grower, a winemaker, a wine marketer, wine educator, wine judge and wine critic, Tom Simoneau is the walking definition of “Wine Guy”. Since Tom is “The Wine Guy” here is a his syndicated wine minute from our Make-A-Wish Event: Click Here to play audio – Make-A-Wish072910. Norcal Wingman on-air Live this Thursday! I will be on the radio with Tom Simoneau this Thursday, July 29th around 4:30 PM, on KSRO’s The Drive with Steve Jaxon. You can listen live by visiting KSRO.com and clicking on “Listen Live” or tuning into 1350 AM, if you live in the greater Sonoma County area. The Drive is on daily, from 3:00PM to 6:00PM (Pacific Time of course) and usually features local Sonoma County luminaries, of a much higher caliber than myself. Check it out HERE. Tom and his wife Brenda really put out the red carpet for us. We decided upon a Cabernet Sauvignon tasting and Tom said he had something creative he’d put together for our group. Upon our arrival we were greeted with glasses of Chandon bubbly and we began getting acquainted over some fantastic hors d’oeuvres, prepared by Tom’s wife Brenda. Now, just to be clear, Tom and Brenda’s house, “Simoneau Ranch,” has one of the most spectacular views of the Alexander Valley that I’ve ever seen. They’re located just east of Hwy 101 in Healdsburg and the view from their back porch looks across the Simoneau vineyards, and up toward the Geysers and off to the right in the distance you see Mt. St. Helena, a truly stunning spectacle! Anyhow, I digress. We chatted about wine and toured the property. Tom showed us his vineyards and gave us a nice look at his cellar where he has cases upon cases of wines stacked to the ceiling, ribbons and awards for his wines, and some empty bottles, “trophies” of past experiences, each with a story. 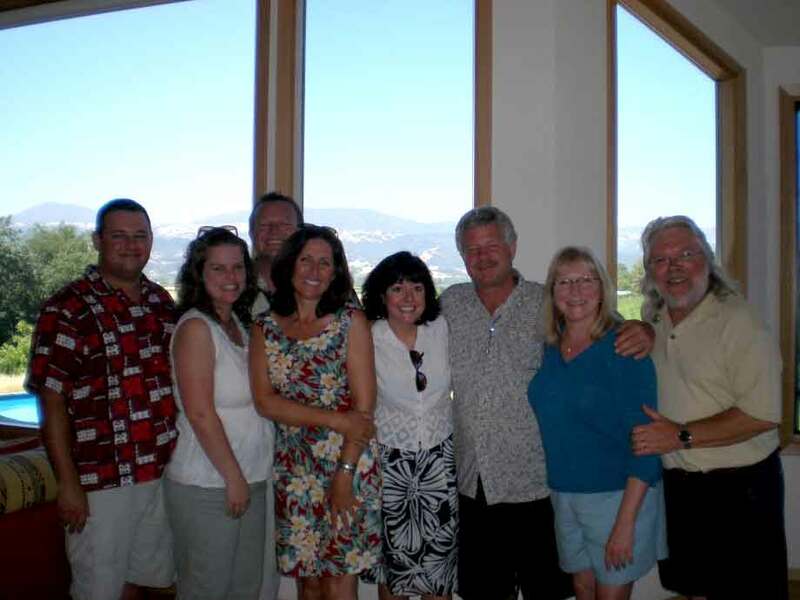 After the tour it was back up to the house where we enjoyed some more snacks and tasted Tom’s two wines, a Chardonnay, “Brenda Lee’s,” a lovely, lightly oaked Chard, with about 10% malolactic fermentation, and his Alexander Valley Cabernet Sauvignon. Oh, I forgot to mention, Tom used to sell his grapes to Silver Oak up until recently when the economy tanked so now he just makes his own Cab (it’s great by the way). Well after some tasty snacks, a goat cheese flan (see recipes below) and some bacon wrapped figs stuffed with blanched almonds, we got on with the main event. 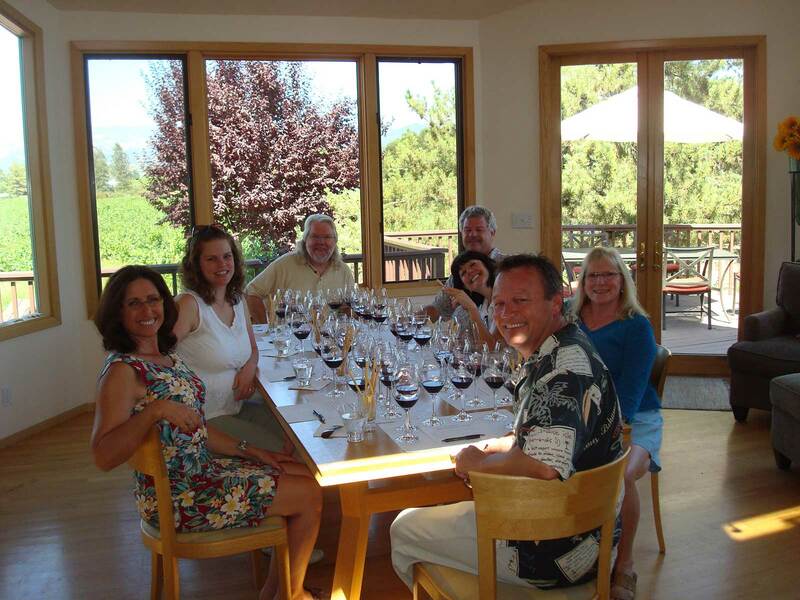 Tom and Brenda had set up a double-blind, Sonoma versus Napa, no-holds-barred Cabernet Sauvignon battle royale! 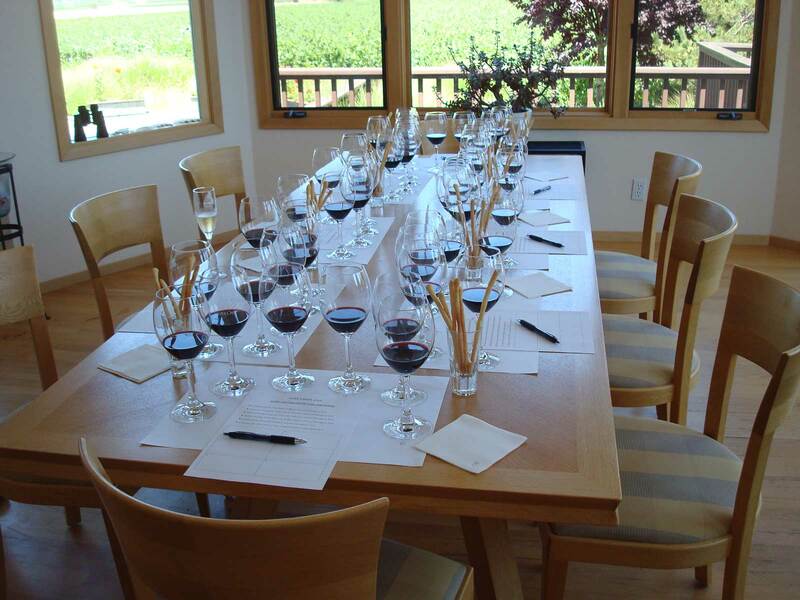 We each tasted though the wines together and discussed the characteristics and qualities we saw, smelled and tasted. It was quite an educational experience for me. Having both Tom Simoneau (who also teaches wine tasting/judging at the local community college) and Mick Schroeter discussing and dissecting the wines and then sharing what they experienced and comparing that to what I was getting out of them was really cool. 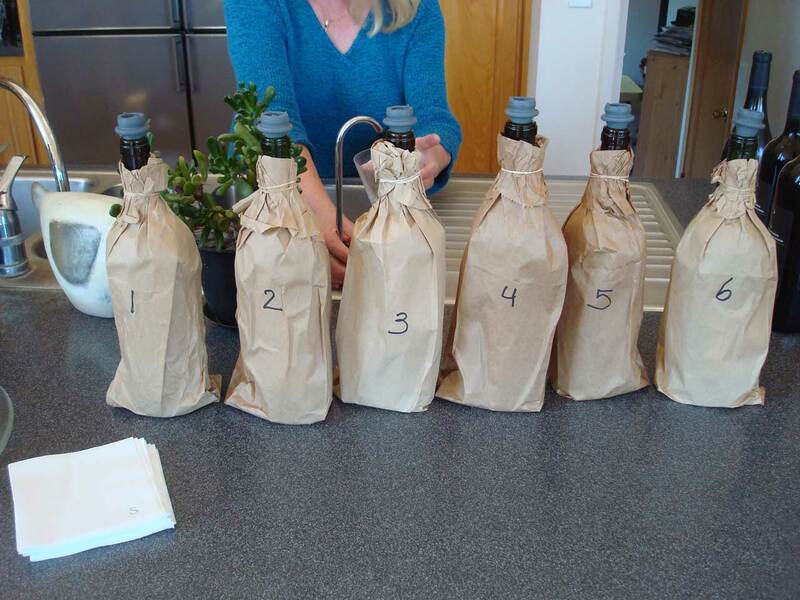 It gave me insight into what a world-class wine maker looks for when tasting and judging wines. It also made me feel pretty good about my own palate and overall sensory capacity for wine, I’m making some incremental improvements (if I do say so myself). First Place: 2006, Swanson Vineyards, Alexis, Oakville, Cabernet Sauvignon. Big and Juicy with grainy tannins, hints of licorice. Second Place: 2004, Robert Young, Scion, Alexander Valley, Cabernet Sauvignon. Coffee and Cocoa cover this Alexander Valley beauty, great tannic structure that is well representative of the AVA. Third Place: 2005, Chateau St. Jean, Cinq Cepages, Sonoma County Red Wine. Soft and supple, ripe red fruit and easy drinking tannins make this Sonoma Valley Red shine. A great time was had by all and I can’t wait for next year’s Make-A-Wish event so I can try and win again. Not only did we have some great wine and great conversation but the money made from Tom’s donation and my winning bid goes to help out a great cause. The Greater Bay Area Make-A-Wish Foundation® grants the wishes of children with life-threatening medical conditions to enrich the human experience with hope, strength, and joy. Please support them if you can, it’s an amazing organization. Again, I want to extend a heart felt thank you to Tom and his wife Brenda for being such gracious hosts. This was truly an exceptional experience and it could not have been possible without their generosity to both the Make-A-Wish foundation, and to us. Below are the recipes of a few of the outstanding treats Brenda Simoneau prepared for us, Enjoy! 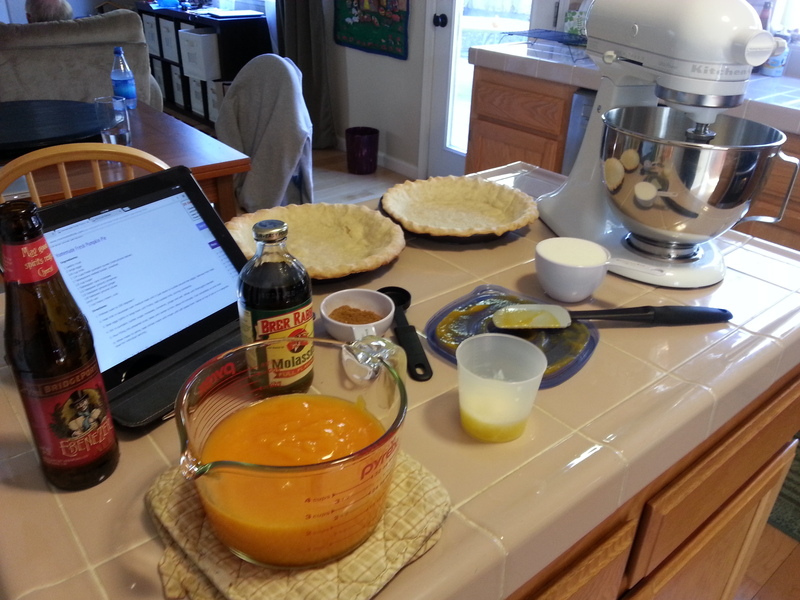 Be on the lookout for a cookbook by Brenda in the not to distant future. Depending on the size of your ramekins (custard cups) generously butter 6 – 8. While the goat cheese is cold remove the rind, place goat cheese in your mixing bowl, cover with plastic wrap, and let it come to room temperature. Once at room temperature, mash with a fork. Add one egg at a time mixing well. Add the sour cream and mix well. Finally, add the salt, thyme, and half-and-half. Mix well. Divide the custard among the ramekins, place them in a baking dish, and add very hot water to the pan so it comes halfway up the sides of the ramekins. 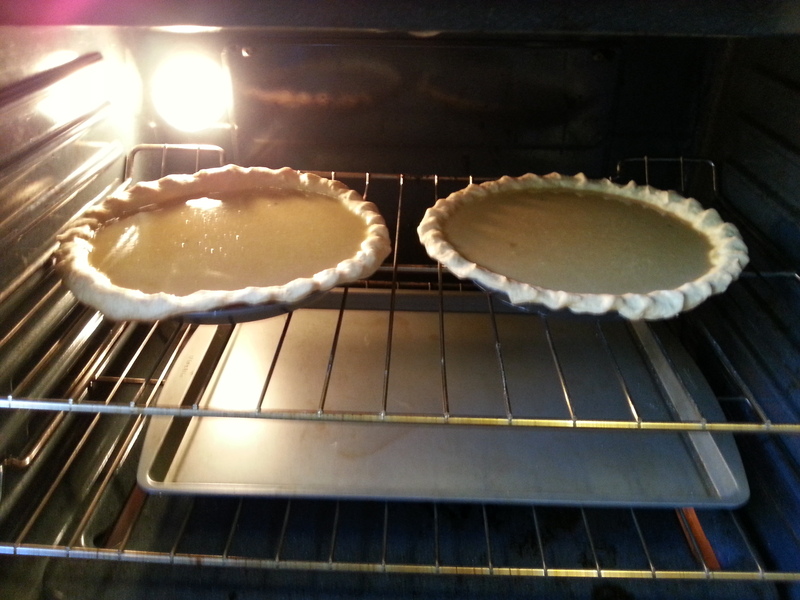 Bake until the custards are set, about 25 minutes. Remove the pan from the oven. Place the ramekins on a cooling rack and let sit for about 5 minutes. Serve warm in the ramekins or run a knife around the edge of each ramekin, turn them out, and serve with a simple green salad. This recipe makes about 76 skinny breadsticks. You’ll want to set up more than one baking sheet, so you can quickly rotate them in and out of your oven. Stir the yeast into the warm water in a large mixing bowl. Let it stand for about 10 minutes. Stir in the olive oil. Add the salt, chopped olives, and 1 cup of flour. Stir until everything comes together. Add half cup flour and stir until the dough comes together. 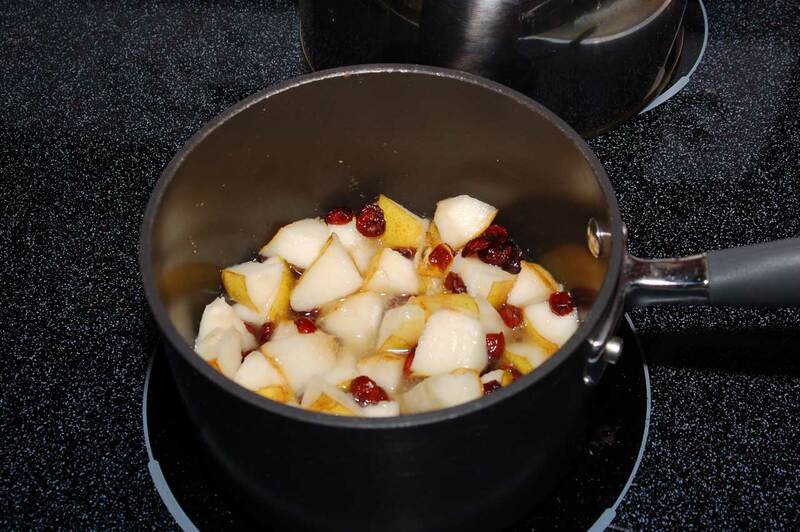 Add a ¼ cup of flour and stir until the dough comes together. Lightly sprinkle some of the remaining flour on your work surface and knead the dough. Sprinkle and incorporate more flour as needed until the dough is smooth and soft. Pat the dough into a rectangle (roughly 6” x 14”) on a surface that you can use a knife on. Lightly brush with olive oil and cover with plastic wrap. Let sit for 30 minutes. The dough should be very elastic now making it very easy to shape your breadsticks. Cut off a piece of dough about as thick as a finger. Lay it on your work surface, roll back and forth as your hands work out to the ends. This stretches out the dough to the desired length. 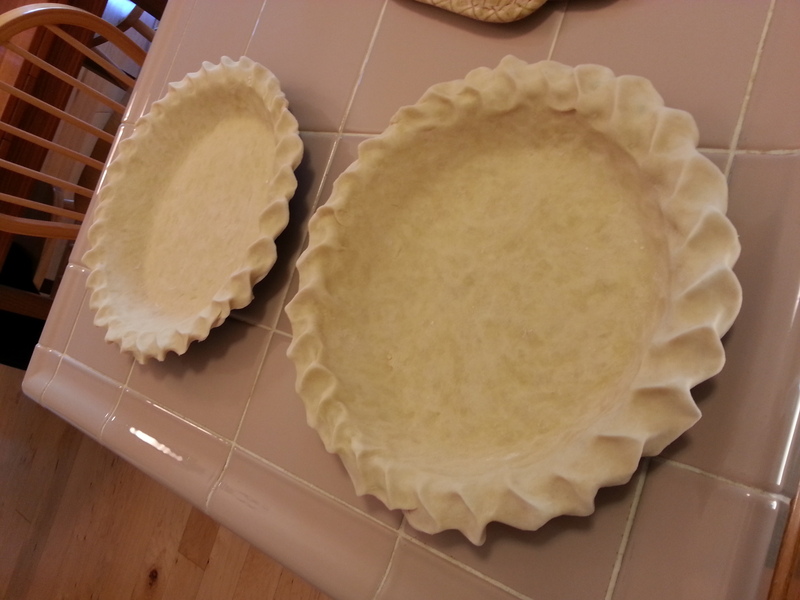 Remember they will puff up in the oven to about twice the thickness that you rolled them out to. Lay them about an inch apart on the baking sheet. Bake for 10 minutes, turn the pan and bake for 10 more minutes. 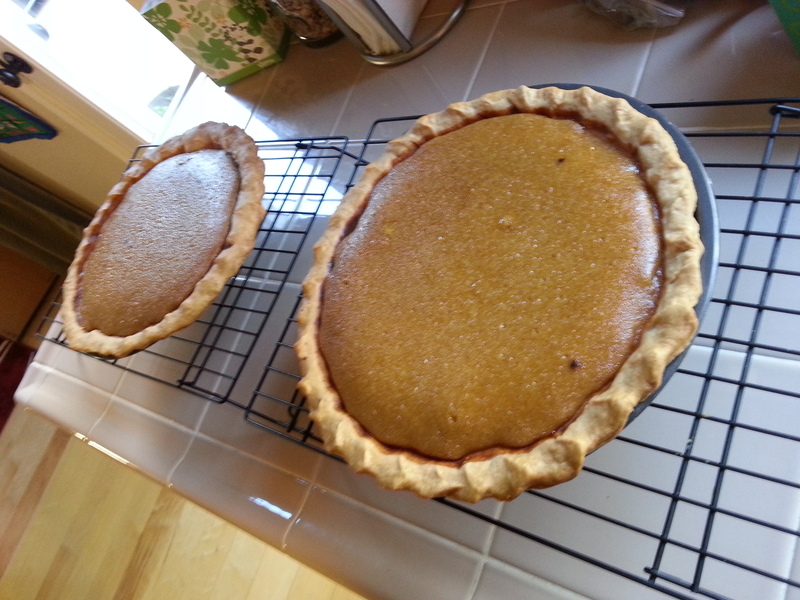 Continue baking and checking every 3 minutes or so until they’re crisp and golden. Slice the chicken against the grain, and then chop into small pieces. You want about one cup. Place the chopped chicken and all other ingredients in a bowl. Mix together. Taste and then adjust the salt and pepper. 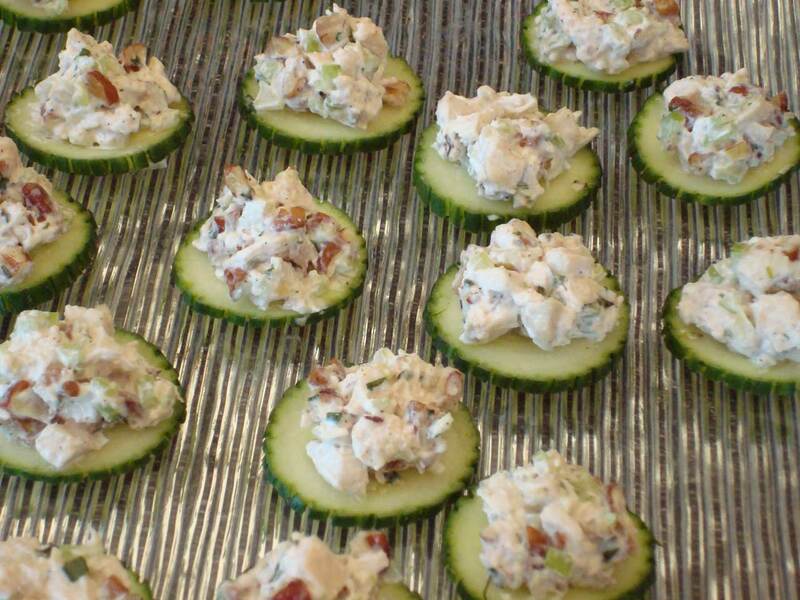 Serve on cucumber slices, crackers, or toast.